Message: "Hello from Fort Nelson, BC, Canada. My name is Sherina, I am 23 years old. I was born and raised in Fort Nelson and recently bought a home to spend another 20 years. It is a small community of 3000 but increases to over 10000 during the winter for work. 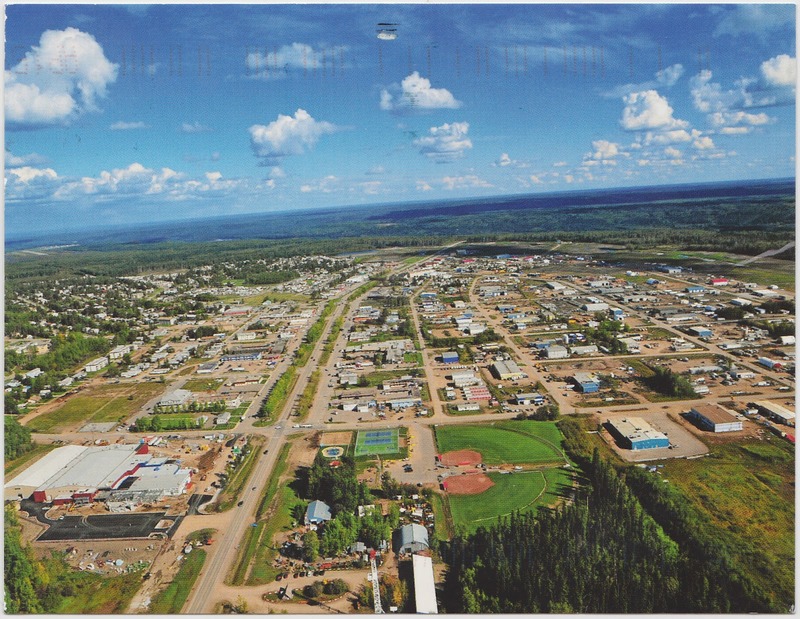 The closest community to Fort Nelson is 4 hours (400 KM's) south." Fort Nelson owes most of its existence and growth to the Fort Nelson Airport (in the 1930s), the creation of the 1,387-mile Alaska Highway (1940s), oil and gas exploration (1950s), and the introduction of a railroad to transport lumber, oil and gas to markets in the south (1970s). Tourism is also important to Fort Nelson, as RVs headed to or from Alaska stop there throughout the year. 1. Fort Nelson is a community within the boringly named Northern Rockies Regional Municipality, which provided the aerial photograph for this postcard.